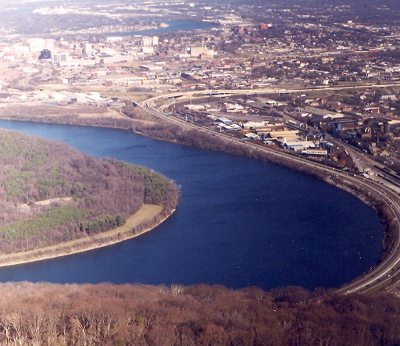 On April 2, 1781, during the Native American war of resistance against the occupation of Middle Tennessee by a young United States of America, a force commanded by the great Cherokee war leader Dragging Canoe attacked Fort Nashborough, the founding site of the city of Nashville, located on a bluff overlooking the Cumberland River. The raid became known as the "Battle Of The Bluffs". It can be considered a Revolutionary War engagement and is one of the most famous incidents of Nashville's early history. 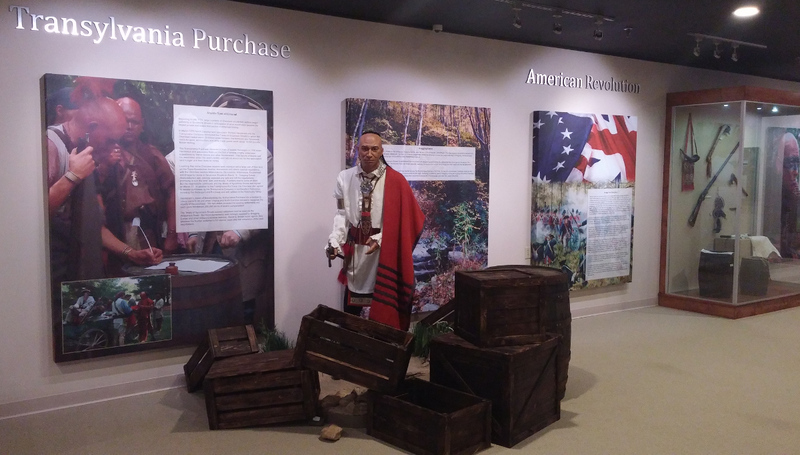 In 1775, at Sycamore Shoals in East Tennessee, a land speculator named Richard Henderson met with a group of influential Cherokee leaders and convinced a few of them to sell the tribe's claim to 20 million acres, an area that included a large part of Kentucky and Middle Tennessee, in a deal that came to be known as Henderson's Purchase, or the Transylvania Purchase. This area was an important hunting ground for the Cherokee and many other tribes, some of whom also had a claim to the area. At the time, Dragging Canoe was chief of Great Island Town. He and his followers strongly objected to the sale. During the negotiations, Dragging Canoe predicted that selling the land would result in the extinction of the Cherokee. He refused to consent to the agreement even though his father, the renowned diplomat Attakullakulla, as well as the great war leader Oconostota, who Dragging Canoe had served under, both supported the deal and signed the agreement. Under the Cherokee system of government, cessions of tribal territory required unanimous consent to be considered binding and anyone who disagreed could not be expected to abide by the terms. Dragging Canoe warned that he and his warriors considered the Henderson's Purchase agreement to be illegal and that they would fight for the land, declaring "You have bought a fair land, but you will find its settlement dark and bloody". The American Revolution broke out one month after the Henderson's Purchase "treaty" was signed. Most Cherokee towns tried to stay neutral in the conflict but a war faction emerged with Dragging Canoe as a principal leader. He considered the war an opportunity to resist the steady encroachment on Cherokee territory. Dragging Canoe began to launch military strikes against the Americans, but their raids on his towns in East Tennessee, as well as on neutral Cherokee towns, forced him to move his people farther to the southwest. In 1779 they settled on Chickamauga Creek, near present day Chattanooga, and became known as the Chickamauga band of Cherokee. No attempt was made to settle the Middle Tennessee area involved in Henderson's Purchase until the late winter of 1779 when James Robertson led a group of men from East Tennessee by an overland route to the place then known as the French Lick on the Cumberland River. John Donelson led another group, made up largely of the families of the men in the Robertson group. They planned to travel by boat down the Tennessee River to the Cumberland River, and from there they would make their way up the Cumberland to Robertson's group. Donelson's party was the first to suffer from Dragging Canoe's promise made at Sycamore Shoals. They had to pass by the Chickamauga towns on the Tennessee River, where they came under heavy fire from the Indians. One boat was also captured along with the 28 people on board, but most of the settlers eventually reached their destination at French Lick in the spring of 1780. 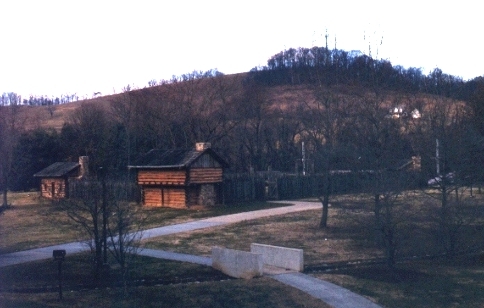 The combined Robertson/Donelson party built Fort Nashborough and other fortified stations as protection against expected hostilities, which weren't long in coming. In the fall of 1780 Native strikes against the Middle Tennessee occupation became a regular occurence. Small parties of Chickasaws, Creeks, Chickamauga Cherokees, and possibly Delawares and Shawnees, began raiding the outlying cabins and harrassing the settlers as they traveled between the stations. The "Battle of the Bluffs" took place a year later, after careful planning by Dragging Canoe and the Chickamaugans. The night before the attack they laid an ambush on a trail that led to Fort Nashborough. The next morning two Indians approached the palisade walls of the fort and fired, then ran off. James Robertson took the bait and led 20 mounted men out of the fort, chasing the two Indians straight into the trap where five settlers were killed and two were wounded. When the settlers got off their horses to fight, the Indian attackers yelled and stampeded the horses. Robertson and his men tried to head back inside the fort and were cut off by a group of Chickamaugans who had been hiding at the rear of the palisade wall. But the settler's horses also tried to return to the fort and broke through the Chickamaugan lines, diverting the attention of the attackers as they tried to catch the valuable mounts. 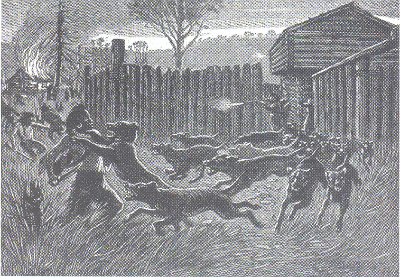 The dogs inside the fort were then turned loose on the attacking Indians, distracting them further while Robertson and his remaining men made it back inside. The Chickamaugans then gathered their dead and wounded and retreated, returning to their homes with 19 of the settler's horses. Of course "Mrs. Robertson siccing the dogs on the Indians" is the historically inaccurate image associated with the battle in the community's consciousness (see Attack on Fort Nashborough above), rather than the settlers losing 5 men and 19 horses. The "Battle of the Bluffs" was only one in a long series of assaults aimed at ending the American occupation of Middle Tennessee. The Chickamaugans and their Creek allies continued attacks on the settlements for the next fourteen years. The Cumberland settlements had to be on guard against attacks at all times. During the years that followed the battle, conditions deteriorated in the rest of the Cherokee Nation, just as Dragging Canoe had predicted at the Henderson's Purchase negotiations, while the Chickamauga towns grew stronger, with more warriors joining the effort to hold on to their ancestral lands. Dragging Canoe sent war parties to East and Middle Tennessee, and to Georgia to fight for Cherokee land, and also sent troops to help other Indian nations threatened by American settlements in the Ohio country, Kentucky, and Virginia. But the Cumberland settlements also grew stronger with booming populations migrating from back East. 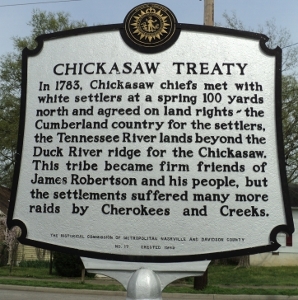 They managed to withstand the Native assault with crucial assistance from the Chickasaw, who became important allies of the Cumberland settlements in 1783, after the Americans won the Revolutionary War. In 1792, shortly after launching efforts to form a confederacy of southern tribes, Dragging Canoe died. His followers fought on for two more years, facing overwhelming odds, until John Watts, who assumed command after Dragging Canoe's death, signed the Treaty of Tellico Blockhouse in 1794 and ended the long "Cherokee Wars". The Chickamaugans had fought for the survival of the Cherokee people for almost 20 years. The peace that followed the Treaty of Tellico Blockhouse can be viewed as a result of their determined struggle - the American government didn't want another war with the Cherokee. During this period the Cherokee revived their national culture, grew strong again, and through treaty negotiations and legal challenges resisted the United States government's Indian Removal policy until 1838, when the Cherokee Nation was forced to emigrate to lands west of the Mississippi River. 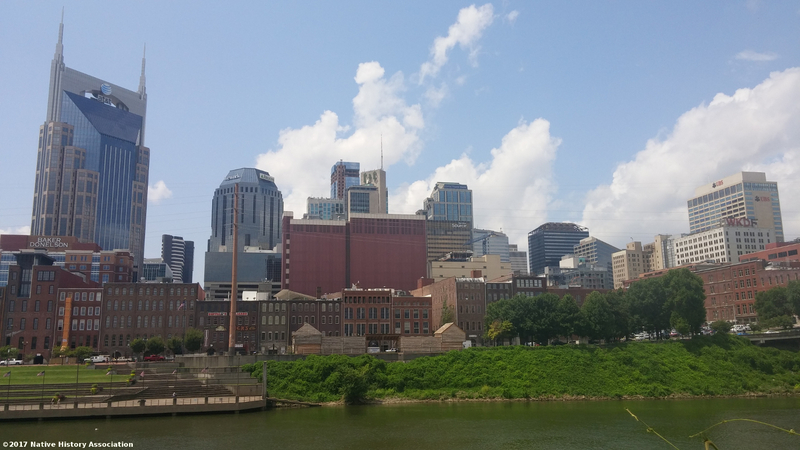 One of the main routes for the Cherokee's forced removal passed through Nashville, crossing the Cumberland River on a toll bridge near the spot where Fort Nashborough once stood. The river crossing is now a certified site on the Trail of Tears National Historic Trail.